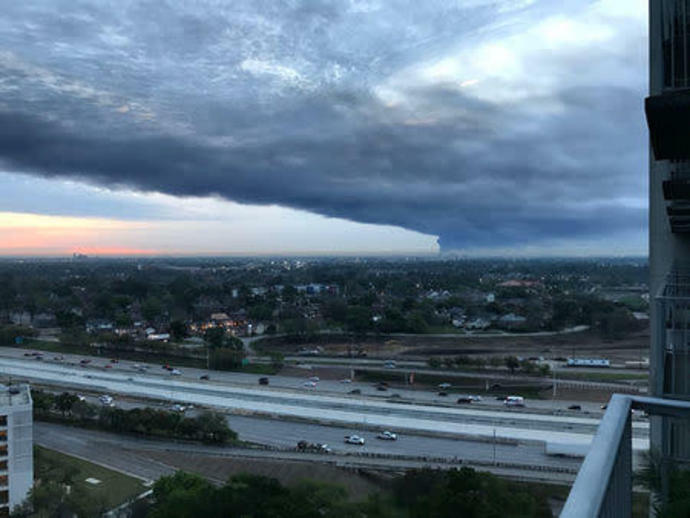 HOUSTON (Reuters) - An earthen barrier holding chemicals that leaked from a massive petrochemical fire outside Houston breached on Friday, prompting restrictions on travel around the site, part of the busiest U.S. oil export port. Intercontinental Terminals Co., a unit of Japan's Mitsui & Co, called for workers at the Deer Park, Texas, fuels storage facility and neighboring businesses to shelter in place. It was the third time this week that chemical releases from the plant prompted local travel restrictions. The breach occurred as emergency workers were pumping pyrolysis gasoline from one of the 11 tanks destroyed or damaged during a fire that started Sunday and took more than three days to extinguish. The tanks can hold up to 80,000 barrels of fuels. Officials were working on a plan to stop the flow of chemicals, water and foam into surrounding areas, ITC spokesman Dale Samuelsen said. The site is near a drainage ditch that flows into the Houston Ship Channel, which connects Houston to the Gulf of Mexico.